As I sit writing this post, everyone else is asleep. I am tired beyond measure, but this is good for my soul right now. This past week, we have all been hit with a horrible cold/flu/sick/chesty cough bug. It’s the first proper time this year that we’ve all been effected at once, We’re pretty good at keeping healthy, especially the kids! *touches wood*. I can honestly say that in the past 6 days, I have probably had a about 10 hours sleep – in total. Its such an awful feeling when you can’t seem to help your little ones when they’re sick, feeling helpless is horrible. The worry of your little one coughing so hard through the night despite having medicine & comfort, the feeling of being so tired and wondering how you’re going to cope and put on that happy brave face the next day even though you feel poorly too. This is the not so fun part to parenting, the worrying and hard part more so. So I feel exhausted, have Low motivation & low appetite, and just feel meh. But each night that has passed with little sleep, I have made sure that I have squeezed in some extra kisses & cuddles, laying beside my little three each in turn, stroking their sweet faces as they drift off to sleep. And to wake up each morning to my three little treasures is a blessing – even if it has been before the sun rises. I’ve also felt a little all over the place in my thoughts too, both personal & blog/photography, and feel like i’m stuck in a rut in regards to my ‘creative side’. I get so annoyed at myself for not succeeding in completing my never ending ‘to-do’ lists, my goals, never feeling like there is enough time to learn what I want to teach myself, to be able to better myself. Organisation is a thing I find hard at the minute too, but with three little ones – it can be tricky, but all the more reason to stay more organised! Creative side of me…my main issue, and always has been is confidence. The feeling like i’m never going to get there. And it’s thinking this a lot thats made me realise, where is there? Of course I have ideas of what it might be, but for now (and for 2015) I am going to focus on taking each step one day at a time, after all the journey is the best part to any destination right? It’s times like these that make you sit back, reflect & count your lucky stars for what you have. It certainly makes you appreciate the great times all the more. Theres a saying i’ve recently come across & it couldn’t be more appropriate. On a lighter note, I had a lovely ‘date morning’ with Ty (& Phoenix) last weekend, we had a morning of Christmas shopping planned but I wasn’t feeling well so we settled for a scrumptious breakfast in a lovely little cafe, and we did manage to pick up a couple of presents. The main thing was that we got to spend time as us two as opposed to Mummy & Daddy (Even though Phoenix was there too but he luckily slept the best part!). It was nice to sit and eat a hot breakfast, have an adult conversation without having the “why’s and please can I have’s” from the girls. It was lovely to walk hand in hand, laugh at each others jokes or general silliness. The last time we had a morning like this was our 8 year anniversary in July, the time before that was exactly this time last year. We’ve made a vow to do it more often, take time out for us. after all without us, there wouldn’t be this wonderful little family that we have, we need to remember to nurture ourselves along with our parenting life, it’s only healthy right? Indecent exposure, I think not. He loves the camera, obvs. All Christmassy in the Covered Market. I had a beans on toast cake for one of my birthday from my Dad, brilliant! I told you I was taller. 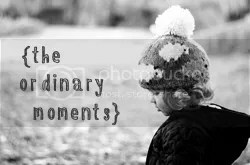 I’ve really enjoyed linking up with Katie’s ‘Ordinary moments’ this year. I love that blogging has opened my eyes to people who share the same passions as me and the fact that they are so friendly, always willing to help or offer support. I love this link up as it’s an important factor in life, capturing the everyday, the simple but sweet moments. In years to come I will be living wondering where my memories have faded to, the everyday ones anyway and I know that they will be in my head but also right here as proof of a wonderful little ordinary life we lead. Happiness is the simple things in life. So sorry you have been poorly 🙁 Hope you will get better before Christmas, and kids are better too now. It has been going around – I was off work for a while and we all were ill, and still coughing a lot. Oh I'm sorry to hear you've all been feeling grotty – it really has been the winter of lots and lots of colds so far, even my husband succumbed which is practically unheard of. It looks like you had a lovely morning date too – I love those cakes, they're incredible! And as for blogging and creativity, I think we have to accept that there is never enough time to do everything you want to do, or at least, not right now. We're both in the same boat with three really little ones but they're going to grow up and apparently there may even be a time when all three play independently together (we can only dream). The best tip I heard was to break down what you want to do and just find three achievable goals for a week and start with those; it's a bit odd trying not to look at the big picture but I know it helps me not become overwhelmed into procrastination!